While Chuisano was winding up their work in Woodstream in 1967, they began to plan an apartment complex to add a finishing touch to the development. The site, eight and one-half acres at Connestoga, Brandywine and Bradford Roads, was originally planned to be used for a shopping center. The developers felt apartments would preserve Woodstream as a model community and desired a buffer to Route 70, so they purchased the land and had it rezoned from business to business-apartments. A smaller shopping center was built in 1973 between Rt. 70 and the complex on land retained by the owners, Zinman and Rohrer. Construction was completed in 1969 on the 128 unit complex of ten buildings designed in a Dutch-Colonial style. 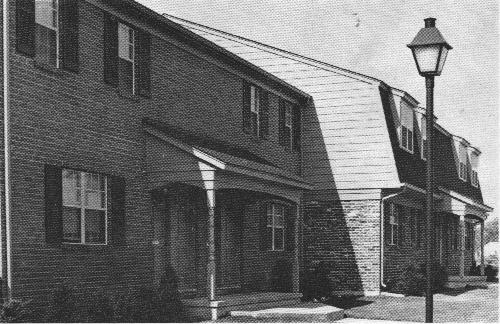 Also included were a swimming pool and laundry facilities.The complex was named Woodstream Apartments. Rents at the time the complex opened were in the range of $125 to $160 for one and two bedroom units. In 1998, the complex was sold and the name was changed to Marlton Meadows.